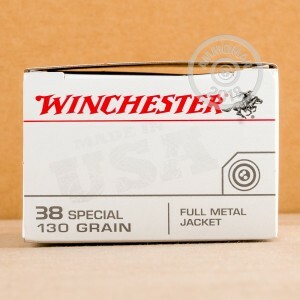 Load your revolver with Winchester "white box" .38 Special ammo for a cheap, fun time at the range. 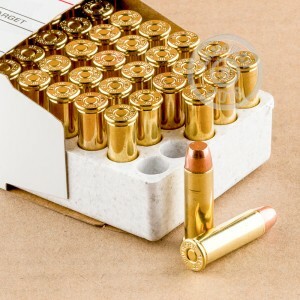 These accurate but inexpensive rounds come in boxes of 50 and fire a light 130 grain full metal jacket bullet at a muzzle velocity of 800 feet per second. This is a relatively mild target load that produces low recoil. Use it in a .357 Magnum and you'll hardly feel a thing! While many revolver shooters use lead round nose bullets, but FMJ projectiles are also popular because they produce less barrel fouling and lead exposure risk than bare lead. They can also be used at indoor ranges and other facilities that may prohibit the use of LRNs. Winchester ammo is made in Oxford, Mississippi using non-corrosive Boxer primers and reloadable brass cases.